GoneToPlaid 2 months, 2 weeks ago. OK,so i am totally confused after reading all the posts here plus my own google search. 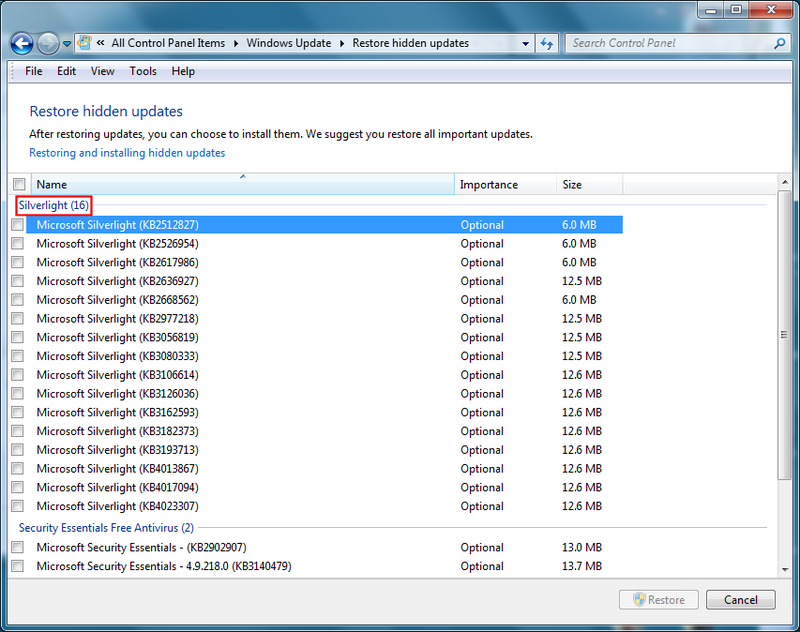 Should i be installing this silverlight kb4481252 patch because it is a security patch that is needed? or Don’t install it because it is for correcting the ‘DateTime calculations to handle new eras in the Japanese calendar” issue as it does say in windows update/more information for kb4481252? I do have silverlight installed on my system with windows 7, ie11. Do you need Silverlight? If not, then uninstall it and hide it along with all the earlier versions. I might add that, unless in Windows 7, the one Windows OS I am familiar with, it is possible to avoid installing altogether even those KB updates one has no idea of what they are for and have no opinion about, so then it is not necessary to uninstall them again. This is how: right click on the KB number listed as ready to install in Windows Update (once the available patches are found, either automatically or at user’s request). That will give you a link to “further information”. Click again and you will be magically transported to the page at MS that tells you what the patch is for. Then, if it is something you do not care for, hide that update and be done with it. So with a bit more digging i found the English version of the German article that some here have refered to… and i think i shall be hiding this patch!! Microsoft has released update KB4481252 for Silverlight on January 15, 2019. Here is some information about what you should know. It is once again Microsoft’s famous attempt to update the changes in the Japanese calendar’s time calculation for 2019. The background is that with the abdication of the current Japanese emperor Akihito on 30.4.2019, a new calendar calculation in Japan begins (see my German article in my Japan blog). Addendum: Some mention that the update should re-enabling streaming in IE 11 (for Netflix for instance). My problem: Microsoft doesn’t mention a streaming fix for Silverlight within its KB article. When I was searching the web I couldn’t find anything about IE 11 Silverlight support through the update. So keep the info in mind, but for me it isn’t confirmed yet. In Office 2010, Microsoft has already tried the calendar update several times without success and even had to withdraw updates. Now Silverlight is supposed to be upgraded for the new calendar with the above date. But why one has to patch Windows, Office and also Silverlight, to support a new japanese area, isn’t clear to me. I would suggest to hide the update (I did it here), if you don’t need the japanese calandar. Who on this planet actually uses Silverlight? Silverlight was MS’s attempt, starting years ago, to try to usurp Adobe Flash Player. As far as I am aware, there are only a few government web sites which actually use Silverlight. Other than that, I have never encountered the need to have Silverlight installed on my computer when going to any other type of web site. The upshot is that Silverlight is not needed, and is nothing more than a potential security hole. Get rid of it. If you ever do need it for anything in government work, then install it. If you have absolutely never used Silverlight, then please uninstall it and always hide it in your Windows Updates. GoneToPlaid: Who still uses Silverlight? A better question: who has Windows 7 and uses IE 11 to stream video? Answer: not me. I use FF, WF or Chrome, as the spirit moves me, or the demands of sites that do not like one or more of those, but like at least one of them. You found the error in my logic. I erroneously assumed that no Windows 7 user in their right mind actually uses IE11 to browse the Internet! I too use either FF or Chrome for all of my Internet browsing. Thus I have no need for Silverlight!